This half-pound bag of Blue Bottle Coffee is a begat. Sometimes, we make purchases so innocently: “Oh, all I need is a chair for this corner, and then the room will be complete.” A day after the chair arrives, we find ourselves pacing the aisles of Home Goods, looking for a few pillows that will “tie in” the new chair to the old furniture. The new pillows, in turn, may function as a begat and lead to a new lump of pottery on the table. Which could make us rethink the floor lamp in the corner. The new lamp is an opportunity to try the innovative, energy-saving compact fluorescent light bulbs. Why not buy a dozen? And so on and on and on. Back to the meager bag of coffee. I bought it in San Francisco, as I stood in line with Steve at one of Blue Bottle’s stands. He and Marcia had been telling me for days: This is the thing, if you like coffee. So, finally, on the last day of my visit, we went. Steve had already told me that Blue Bottle was not just a coffee; it was a method. Nay, it was a way. I was fully prepared, and eager. Hmm. I only hesitated a moment. “Well, I don’t have a grinder — I brought it to work years ago and it disappeared — but I’ll buy one.” Really, on the spot I decided to buy a grinder when I got home. 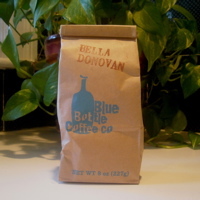 The 8 ounces of Blue Bottle’s Bella Donovan was about $8 in San Francisco. Three days ago, back in Boston, I did buy a new coffee grinder; it was $30 on sale. And while I was in the small appliances section, I looked at coffee makers, too. After all, mine is old, on its seventh life, and almost uncleanable. Yes, I did. New coffee maker: $80 on sale. Next? Cups. That is the story of a begat. I love the etymology of “begat”! What a great term. But reliably excellent coffee is well worth a few “begats.” Enjoy! I think your coffee might also be Diderot’s Dressing Gown… Watch out! Rosemary, oddly, my new coffee maker is nice, but the coffee itself did not travel well from SF. Or, perhaps I ground it poorly. Renee, I actually avoided a Diderot’s Dressing Gown scenario a month ago, when I got a new Rx for my nearsightedness, and I decided to keep my old frames and just get the lenses upgraded. 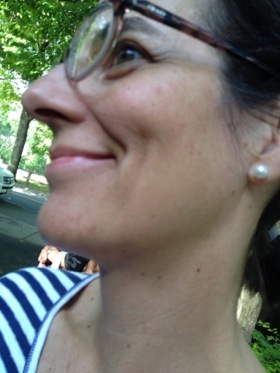 I realized, as I was trying on lots of new frames, that if I bought new ones, I might need to throw out all my existing clothes and buy “contemporary” ones, that being the adjective the optometrist used to describe the frames she was advocating. Alas, no coffee is going to be as good at home as it was in San Francisco. It’s the ambiance, not the coffee, that doesn’t travel well. “You’re not our target customer”?! Really? Wow, that’s amazing. My sister and a friend once walked into Victoria’s Secret and were told by the twiggy clerk at the front of the store that “The bathrobes and flannel pajamas are in the back.” Just ’cause you hear it in training doesn’t mean you actually *say* it to the customers!